Does the thought of turkey, cranberry sauce and stuffing—again—leave you feeling a bit uninspired? This year, jazz things up with some slightly different dishes that will impress your guests and reinvigorate your holiday table. Of course what you pour is just as important as your menu, and Sonoma-Cutrer has the perfect wines for your feast. With the help of a few inspired recipe ideas and wine pairings that will elevate your offerings, it’s simple to create a truly memorable meal. Set the tone with a made-for-fall soup that lets guests know this isn’t your standard Thanksgiving spread. Pumpkin Soup with seasonal wild mushrooms becomes a showstopper when served in individual pumpkin bowls. A warming Winter Squash Soup is a tasty alternative, both of which pair nicely with a glass of crisp, versatile Russian River Ranches Chardonnay. Bold enough to bypass the turkey this year? If so, give your guests something to gawk at with individual Smoked Game Hens. Brined in cider for moist, flavorful results, these birds also pick up a rich smoky flavor when cooked over wood chips on the grill. If you’d rather stick to the traditional Thanksgiving centerpiece, not to worry—the same brining technique will work quite well on turkey. Either makes a fantastic partner for Sonoma-Cutrer’s Russian River Valley Pinot Noir. Lush and silky, the fruit-forward pinot is light enough to let the poultry shine through. For an intimate Thanksgiving meal, or impressive sidekick for your turkey, try serving a Slow-Roasted Duck. Surprisingly simple to prepare, the rich duck is an ideal pair for a glass of complex yet elegant Founders Reserve Pinot Noir. Top off your meal with a dessert that will challenge pie for a permanent place on your holiday table. Pumpkin Cheesecake with a graham-cracker crust is a fitting finish, while a simple Apple Batter Cake is a slightly lighter option that celebrates the season equally well. Uncork a bottle of succulent Late Harvest Chardonnay to serve alongside your dessert and raise a glass to family, friends and an exceptional meal. Enjoy the warmer weather by hosting a wine and appetizer party! Read how blogger The Taylor-House used summer seafood and Sonoma-Cutrer Sauvignon Blanc at her wine party. At cheese tastings in Paris, you’ll often find artisanal butters amidst the spread because butter’s creaminess can enhance the plushness and/or sharpness of certain cheeses. The same goes with wines like Chardonnay, whose aromas and flavors can range from merely hinting at cream and butter to downright dripping with it. Whether you’re choosing an unoaked, moderately-oaked or full-on-oak Chard, there’s a wine style for every style of cheese. If you haven’t been paying attention to Chardonnay for a while because it’s “too oaky,” you’ll be happy to learn that producers have heard you and are now creating many Chards with only minimal-oak (barrel) contact, or none at all, using terms like “unoaked” or “virgin” on the label. Chablis, from France’s Burgundy region, is the standard bearer of unoaked Chards. Sonoma-Cutrer’s Russian River Ranches Chardonnay is an example of restrained oak, allowing assertive acidity to balance minimal creaminess. Best cheeses to pair with these fruity, crisp, minerally Chards tend to be young, semi-soft cheeses, like Gouda, Asiago, Fontina, Jack and, why not, Ossau-Iraty (a nutty goat cheese from Spain). Moderately-oaked Chards dance the fine line between elegance and richness; their creamy roundness is balanced with bright, mouthwatering acidity, and highlighted with aromas and flavors of apple, pear and lemon zest. Sonoma-Cutrer’s Sonoma Coast Chardonnay is a fine example of this style, fusing aromas of Golden Delicious apple, Bosc pear and white peach with toasted nuts, oak spice, and a hint of butter. A cheese-pairing strategy with these medium-bodied wines is to offer contrast, by way of decadent, creamy triple-crèmes, like Camembert, Brie and Explorateur. A hint of pungency is an attractive nuance to pair with these wines, too. When it comes to choosing Chardonnays that are fermented and aged in oak barrels that offer balance and elegance, you get what you pay for. While everyone loves an everyday $10 Chard, they can’t hold a candle to a great Grand Cru white Burgundy, or a Burgundian-style Chardonnay from the New World. Sonoma-Cutrer’s Les Pierres Chardonnay possesses the best of both worlds, with classic stony minerality, caramelized oak, and toasted spice aromas and flavors that integrate beautifully with refreshing, citrus flavors. Cheeses that pair well with these powerful, elegant wines tend to be the most powerful, pungent cheeses, specifically the “blues,” like Roquefort, Gorgonzola and Stilton, whose profound creaminess, unctuousness and distinct, pronounced flavors pay the perfect complement to these Chards. Are you scrambling to find a few last-minute gifts? Whether you’re shopping for a seasoned oenophile or someone who’s just discovering wine, we’ve got some ideas to help you cross off those last few names on your list. A gift of wine is always appreciated, even more so when it’s accompanied by thoughtful wine accessories. Glassware is a nice addition, especially for a friend who may be new to wine. Bonus points for matching the type of glass with the wine you’re gifting. If you’re giving a bottle of Chardonnay, include glasses with a wide, shallow bowl, which will allow the wine’s complex aromas to open up. For a nice bottle of Pinot Noir, look for a wide bowl and tapered top, which regulates the wine’s acidity, alcohol and sweetness. Whether you opt for stemless glasses or fine crystal goblets, enjoying wine in the appropriate glassware will enhance the experience. Is there someone on your list who does a lot of entertaining? Give a serving gift that will be thoroughly enjoyed this holiday season. A wine decanter is a nice companion to a gift of red wine. Available in everything from crystal to hand-blown glass, elegant decanters do double duty, offering a lovely presentation while aerating the wine. For those who prefer white, make a statement by presenting a bottle in a classy wine chiller. From iceless varieties to marble coolers and statement-making wine buckets, you can find a style to suit any preference and price range. Looking for something a little more whimsical? Help your favorite wine enthusiast turn their favorite empty bottles into flickering tabletop centerpieces. Options include everything from simple ceramic wicks that you place in the top of empty wine bottles to complete oil lamp kits with elegant glass hoods to surround the flame. Select a bottle of wine from your favorite vintner then personalize your gift with the perfect accessories for anyone on your list. Now all that’s left to do is sit back, uncork a bottle for yourself and toast your gifting triumphs. Sonoma Cutrer has had a long association and friendship with winemakers and coopers from the Burgundy region of France. Burgundy is the home of both Chardonnay and Pinot Noir. This year’s menu honors that friendship with 3 recipes that reflect the flavors of that amazing part of the world. This is a recipe based on the classic French celeriac remoulade which is available almost universally in charcuteries and delis in that country. It’s delicious and can easily be made a main course with the addition of some smoked salmon, cooked shrimp or paper thin sliced parma ham. Salad can be made ahead and stored refrigerated for up to 3 days. Garnish: Savory young greens such as arugula, cress and/or mustard, sieved hard boiled egg and chopped chives. Finely julienne the celery root by hand or with a mandoline or similar cutter and set aside in a bowl. In a separate bowl mix together the mayonnaise, buttermilk, mustards, lemon juice and vinegar until smooth. Stir in celery root to evenly coat and season to taste with salt and pepper. To serve: Place greens attractively on chilled plates. Mound salad on top and sprinkle sieved hard boiled egg and chives over top. This simple French inspired rustic braise is served with sautéed apples. Pick an apple that doesn’t turn mushy, but holds its shape when cooked; Cortland, Jonagold, Northern Spy, Winesap, and Golden Delicious all fit the bill nicely. Trim excess fat from duck legs. In a saucepan heat 2 tablespoons of oil and add onions, garlic, carrot and celery and sauté until lightly browned. Add the peppercorns, bay, juniper berries and wine and simmer for 10 minutes partially covered. Cool completely and then add duck legs and marinate in the refrigerator for at least 4 hours and up to 12. Remove legs from the marinade and pat dry, reserving the marinade. Sauté duck legs in remaining 2 tablespoons of oil until golden brown on all sides. Place duck in a skillet big enough to snugly fit the legs in one layer. Heat reserved marinade and stock with vegetables and the prunes to a simmer. Pour over duck and simmer gently covered for 1-1/2 hours or until the duck is tender. Remove duck and keep warm. Strain the cooking liquid, pressing down on the solids. Remove as much fat as you can. Place in a saucepan and reduce over high heat to a nice sauce consistency. Season to your taste with salt and pepper. Sauté the apple slices in butter quickly until lightly browned. Place apples on warm plates, top with the duck and ladle the prune sauce over. Crème brûlée can be flavored endlessly, but this simple classic version is the best I think. Pour the cream into a medium saucepan, scrape the seeds from the vanilla bean into the cream, and add the vanilla pod. Bring just to the simmer over moderate heat. Remove from the heat and let cool to room temperature. Remove the vanilla pod and scrape any remaining seeds into the cream. If using extract instead, add it now. Preheat the oven to 325 degrees. In a medium bowl, whisk the egg yolks until pale in color. Whisk in the 1/2 cup granulated sugar until dissolved. Gradually whisk in the cream. Stir in the Grand Marnier if using. Place six 6-ounce ovenproof ramekins in a baking pan. Divide the custard mixture among the dishes. Pour hot water into the pan to come halfway up the sides of the dishes. Bake in the oven for 35 to 40 minutes, or until the center of each custard still jiggles slightly. Remove from the oven and lift the dishes from the hot water. Let cool, then cover each and refrigerate for at least 2 hours or up to 2 days. When ready to serve, place the dishes on a baking sheet. Evenly sprinkle 1 tablespoon brown or granulated sugar over each ramekin. Using a hand-held blowtorch, caramelize the sugar by holding the torch about 4 inches from the surface of each custard and moving the torch to brown and caramelize the sugar evenly. Alternately preheat the broiler and place the pan about 4 inches from the heat source; watching carefully, broil until the sugar turns golden brown, 1 to 2 minutes. Halloween is the unofficial kickoff to a season packed with endless sweets. Caramel apples and pumpkin cheesecakes give way to pecan pies and spice cakes, only to be topped by holiday cookies and all manner of chocolate confections. Choosing a wine to go with dessert can be tricky. Overly sweet flavors can easily overshadow the wine, while a bold wine may overwhelm a more mellow dessert. We’ve got some perfectly balanced suggestions to get you through the dessert season, plus a few tempting recipes that just might find their way onto your fall table. Wary of finishing off a festive dinner with yet another pie? Try this lovely pumpkin cake instead. Play up the seasonal flavors by icing it with orange frosting, and serve with a glass of Sonoma Coast Chardonnay. The wine’s toasted nut and spice accents play up the recipe’s cinnamon and nuts, while the hints of vanilla and butter are natural companions for any cake. And while you’re branching out from pastry, why not swap out the ubiquitous apple pie for an apple batter cake? Packed with tart green apples, this simple cake embraces fall with freshly grated nutmeg and rum-soaked golden raisins. Serve a slice with a glass of Late Harvest Chardonnay, Sonoma-Cutrer’s first offering in the limited-run Winemaker’s Reserve series. This sweet, balanced wine features fruit accents, floral notes and a bit of brown sugar. It also makes a fine pair for fruit tarts and crème brûlée. Looking for a sweet finger food to pass around your party? Wow your guests with dried cherries in a pinot noir reduction spread on a heavenly bed of triple cream cheese and topped with a delicate sliver of crystallized ginger. Prepare the recipe with Sonoma-Cutrer’s Vine Hill Pinot Noir, then fill up your guests’ glasses with the same. With accents of black cherry and blackberry, this elegant, rich pinot is the perfect pairing. When in doubt, reach for a bottle of The Cutrer. The list of flavor notes found in this rich and creamy Chardonnay reads like a dessert menu, with hints of baked apple, crème brûlée, butterscotch, caramel and even warm pie crust. And remember, while it’s generally best to choose a wine that’s a bit sweeter than the dessert, you’ll ultimately want to find a balance between sweet and savory. Mother’s Day is a time to celebrate the wonderful mothers who devote their time and affections to their families. To honor her, treat her to a delicious, home-made meal complemented with her favorite Sonoma-Cutrer Wine. Mom is sure to be thrilled! Preheat the oven to 375°. Season the chicken well on both sides with salt and pepper. In a large ovenproof pan or Dutch oven large enough to hold all the thighs in a single layer, heat the olive oil over medium-high heat. When the oil is hot, add the chicken, skin-side down, and sear until golden brown, 5 to 6 minutes. Add the garlic cloves to the pan and flip the thighs over. Cook until the garlic is fragrant and has gotten lightly browned, 2 to 3 minutes. Remove the chicken and garlic from the pan and set aside. With the pan is still hot, add the onions, lemon slices, fennel seed and oregano and season with smoked paprika, salt and pepper. Cook, stirring until the onions have softened and the brown bits on the bottom of the pan have loosened, 6 to 8 minutes. Off heat, stir in the fresh fennel and then nestle the thighs skin-side up in the onion mixture and add the garlic and the olives. Pour the lemon juice over the chicken and transfer the pan to the oven. Bake uncovered for 35 to 40 minutes or until chicken is cooked through. Scatter fresh oregano leaves and feta, if using, over the top and serve. A simple salad embraces all of the basic senses of taste: sweet, sour, bitter salty and umami. Combine the frisée, cress and endive in a large bowl and toss gently with a bit of the vinaigrette to lightly coat. Arrange artfully on 6 plates along with the grapefruit sections. Place a wedge of cheese on top, scatter almonds around along with the chervil. Serve immediately. *Upland cress is sold with its roots and soil attached in many markets. Looking for a fun way to celebrate Dad this year? Skip the ho-hum necktie and opt for a classy picnic instead. Turn a simple meal on a blanket into a celebratory outing with a few father-approved recipes, the perfect Sonoma-Cutrer wine pairings—plus some fun picnic-themed gift ideas to cover all your bases. There’s a time and a place for a basket full of cold cuts and pre-made potato salad, but Father’s Day is not one of them. Think outside the box—er, basket—and plan Dad’s spread around a showstopper like Grilled Korean-Style Short Ribs. Easy to make ahead, these flavor-packed ribs blend an exotic mix of flavors ranging from fresh ginger to chili flakes. Pair with a smooth, juicy red like Sonoma-Cutrer’s Russian River Valley Pinot Noir to complement the bold flavors of the beef. Is Dad more of a hands-on grill man? Scope out a well-equipped picnic site and let him get in on the fun when you toss a few tasty Halibut Hobo Packs over the coals. Prosciutto, citrus and capers infuse the fish with flavors that pair perfectly with Sonoma-Cutrer’s distinctive Les Pierres Chardonnay. If you want to stick to classic picnic fare, plan your meal around a beautiful Sonoma-Cutrer Roasted Chicken, a crowd pleaser packed with fresh herbs and plenty of garlic. Elevate this lovely dish by serving it with a special-occasion worthy bottle of Founder’s Reserve Legacy Chardonnay. Still stumped about a gift? Play off the picnic theme with an insulated wine tote, vintage corkscrew or picnic-ready stemless wine glasses. Consider throwing in a nice selection of artisanal salts and gourmet spreads for foodie fathers, or surprise active dads with a new bocce ball or croquet set to enjoy between helpings. For a gift that keeps on giving, why not sign Dad up for Club Cutrer? He’ll get first dibs on limited release wines, enjoy discounts and receive three exclusive shipments of Sonoma-Cutrer wine throughout the year. No matter what you pack in your Father’s Day picnic basket, turn it into a truly memorable celebration with your favorite bottle of Sonoma-Cutrer wine. It’s always a good idea to keep a bottle of wine on hand for the holidays! Read why blogger HappyHourProjects always chooses Sonoma-Cutrer for her holiday wine selection here. Here is a special menu especially created by Chef John Ash for National Pinot Noir Day. The flavors in each recipe pair beautifully with Sonoma-Cutrer Pinot Noir Wines. Heat oil in a medium saucepan. Add the onion and until golden, about 5 minutes. Add the ginger and garlic and stir for a couple of minutes. Add the coriander, cumin, salt and pepper. Add the carrots, cook for another minute or two. Add stock and bring to a boil. Cover, reduce heat to medium-low and simmer until carrots are tender, about 20 minutes. Off the heat, use an immersion blender to puree it or alternately use a regular blender and carefully puree it being mindful of the hot liquid. Add more stock if the soup is too thick. Reheat over low heat and adjust the seasonings to your taste. Serve with a swirl of yogurt and a sprinkling of cilantro. *If Asian Pears aren’t available, use tart-sweet apples, regular pears, mangos, or whatever else is best in the market. In a large salad bowl, whisk the lemon juice, olive oil, shallots, honey and salt and pepper together. Gently toss the arugula to coat it with the dressing. Add the pears and toss them with the arugula once or twice. Arrange attractively on plates and top with the cheese and the prosciutto. This is a delicious dish and I think a perfect match with Sonoma Cutrer Pinot Noir. The sauce can be made ahead and reheated. Serve with an earthy combination of pan roasted mushrooms and sautéed kale. Separate the breasts into 4 supremes and score the skin side of the duck breasts in a diamond pattern with the point of a sharp knife. Season both sides liberally with salt and pepper. Heat the oil in a heavy skillet until nearly smoking and add breast skin side down. Sear until nicely browned and much of the fat has rendered. Turn breasts over, reduce heat and continue to cook until medium rare. Off heat and allow breast to rest of 3 or 4 minutes before slicing. Slice each breast into an attractive fan and arrange on warm plates. Spoon sauce around and serve immediately. Heat the olive oil in a deep saucepan and sauté the shallots and mushrooms over high heat until golden brown. Add the wine, stock and blackberries and reduce by half over high heat, approximately 15 minutes. Strain through a fine mesh strainer, pressing down on the solids. Return sauce to pan and add sage and port and continue to reduce until lightly thickened. Season to your taste with honey, salt and pepper. To finish the meal, I’d suggest a simple cheese plate garnished with your favorite fresh fruits. Cheeses that work especially well with Pinot Noir are “Stinky” cheeses such as Tallegio and Epoisses. Semi-hard, medium aged cheeses such as Gruyere, Manchego and young Cheddars also are delicious. How about picking one from each category? It’s no secret that at Sonoma-Cutrer, a favored topic is terroir, or how a vineyard’s specific geology, geography and climate affect the flavors that end up in your glass. While you’re probably not thinking about the fog rolling in off the Pacific, or the California sun warming up the rocky soil when you savor that first sip, the truth is, terroir is directly responsible for the complexities that make our wines distinct. So how does terroir translate to taste? It’s a good question that could involve a lengthy conversation! But we will spare you. Instead, let’s start by lifting a glass to the celebrity here in our part of the world: the fog. At Owsley Ranch, our closest vineyard to the Pacific, ocean breezes blow cool fog off the water and into the narrow Bloomfield Gap, where it’s concentrated between steep hillsides before blanketing over the valley to make it up to 10 degrees cooler than other areas in the region. This results in fewer, smaller grapes, which means intense concentrated flavor. So, when you take that first sip of Owsley Ranch Vineyard Pinot Noir, the deep earthy flavors and dark fruit complexities that you taste are directly indebted to those thick blankets of fog. Grapes grown at Les Pierres vineyard are more influenced by the soil, which is made up of 50-70% rock (hence the name, which translates to “The Stones”). This inhospitable rocky soil makes the vines work extra hard to grow and gives low yields of smaller grape clusters with incredibly rich flavor. The rocks in the soil at Les Pierres also absorb sunlight, slowly releasing the heat to offset the cool fog and lengthen the growing season. The resulting fruit is infused with a stony minerality that makes Les Pierres Chardonnay utterly distinct, a true reflection of the vineyard’s terroir. The next time you’re sipping your favorite Sonoma-Cutrer wine, raise a glass to the dense fog, ancient riverbeds and distinguishing soils of Sonoma-Cutrer. After all, they are responsible for the depth and complexity of the wine you are enjoying. Cheers! This wine tasting primer is designed to give you a comprehensive understanding of the components of tasting wine. To make it easier, feel free to taste along if you wish. All you need is a quality wine glass of eight or more ounces and a bottle of Sonoma-Cutrer 2015 Sonoma Coast Chardonnay. There are 3 points of emphasis in any wine tasting- Sight, Smell and Taste. Sight– Usually a full color will suggest a full wine and a light color will suggest a light wine. Our Sonoma Coast Chardonnay is yellow-gold, clear and bright. Smell– I use the acronym FEW to help remember this part of the tasting. F stands for fruit and floral, E for earth and W for wood or oak. Fruit can cover the entire world of fruits, but think about fruits that are in the range of the color of wine. For example, white wine may have flavors of citrus and apples; red wine may have flavors of red cherries and black berries. Earth can encompass everything from the smell of fresh tilled soil to minerals. Like many other flavors in wine, it is not always present. Wood or oak is used to age a good deal of wine, but not all. It can give a wine the smell of spices like, cinnamon, vanilla, allspice and more. To better smell your wine, try swirling it in your glass to release the aromas and make it easier to describe its flavors. Our Sonoma Coast Chardonnay smells of apple, pear and lemon zest with the oak enhanced flavors of toasted nuts, baking spices and a hint of vanilla. Taste – Our taste buds are equipped to sense four basic flavors: Sweet, Sour, Bitter and Salt. Sweet is the presence of sugar in wine. Dry is the absence of sugar in wine. Medium-dry falls in somewhere between the two. You usually detect sweetness on the tip of your tongue. To better understand dryness in wine, try this simple demonstration: Place three glasses of water in front of you. Into the first glass of water, pour an entire packet of sugar – this equals sweet. Put a half packet of sugar into the second glass – this is medium-dry. No sugar will be put into the third glass of water which equals dry. Sour refers to the acidity in wine, and while it carries a negative connotation, it really refers to the zippy-crisp component in wine. It typically can be sensed on the sides of your tongue. Let’s take our three glasses of water again. Into the first glass of water, squeeze an entire lemon this would be very crisp. In the second glass of water, squeeze half of a lemon this represents crisp. Put only a few drops of lemon juice into the third glass this is our low acid or not very crisp. Bitter refers to the tannins in wine. Like sour, it carries a negative connotation. But, it actually refers to the mouth-puckering quality of wine. It may be sensed all over your palate. A heavily tannic wine can make any part of your mouth contract and dry out. A wine can be described as light, medium or heavy in tannin. Tannin can be sensed in grape skins, long steeped tea and espresso. Tannin is typically found in red wine because of the extended skin contact with the unfermented and fermenting wine during red wine production. So, we won’t really find any in our Sonoma Coast Chardonnay. When you taste wine, allow the wine to stay on your palate for a minute, letting all parts of your palate touch the wine. This will allow you to more accurately use the various areas where you sense the taste of the wine. Sonoma Coast Chardonnay is dry and crisp. Also, through your palate, you can establish the body or weight of a wine. The body of a wine is described as light, medium or full bodied; like a glass of water, milk or heavy cream respectively, Sonoma Coast is a medium to full-bodied Chardonnay. Your olfactory system senses smell in your palate, as well as, through your nose. This helps you to connect the wine’s smell and taste. The aftertaste is the lingering flavor you get after swallowing the wine; an aftertaste is only bad when it tastes bad! A good aftertaste is pleasant and persistent. Our Chardonnay has a very pleasant aftertaste. Overall, we would characterize the Sonoma Coast Chardonnay as yellow-gold with a nose and palate of apple, pear and lemon zest with the oak enhanced flavors of toasted nuts, baking spices and a hint of vanilla. It is dry, crisp, and medium to full-bodied with a very pleasant aftertaste. And don’t forget the easy descriptors like this deliciously, tasty Chardonnay is superb. Crisp air and crackling fireplaces turn food cravings toward warm, cozy dishes that can chase away the chill of fall’s arrival. Comfort foods like soups and stews are staples of the season, but they can be tricky to pair with wine. Learn which wines go best with your favorite family recipes and find a few new favorites with this handy guide to warm dishes that will carry you through the cool months. ‘Tis the season for soup, and the best versions take full advantage of fresh cool-weather crops. Sonoma-Cutrer consulting chef John Ash has several soup recipes perfectly suited for the season, starting with a creamy Pumpkin Soup with Wild Mushrooms. Showcasing a pair of favorite fall flavors, this soup scores extra points when served in small, individual hollowed-out pumpkins. Ash’s easy to prepare Winter Squash Soup is another great option if you’re short on time, and you can experiment with different types of squash. Got a fall garden bursting with radicchio? Try this simple Radicchio Soup with Smoked Goat Cheese, which tastes complex thanks to the inspired flavor contrast of smoky cheese and bitter radicchio. All three soups are ideal pairings for a crisp glass of Russian River Ranches Chardonnay, with its elegant fruit accents and bright acidity. If you prefer to sip red when temperatures get crisp, Sonoma-Cutrer’s Russian River Valley Pinot Noir is a fine accompaniment to many traditional fall favorites. Chili and cornbread is about as comforting as it gets, perhaps rivaled only by a warm bowl of hearty gumbo. Both are perfect companions for the pinot, thanks to the wine’s juicy dark fruit notes and silky tannins that complement the rich, complex flavors and meatiness found in both dishes. Finally, it’s unfathomable to talk about warming cold weather comfort foods without mentioning an all-time favorite: chicken pot pie. This savory, soul-warming dish is elevated to the next level when accompanied by a rich and creamy white like The Cutrer Chardonnay. Whatever dishes you warm up to this season, there’s a perfect bottle of Sonoma-Cutrer wine just waiting to be uncorked. Every family has their beloved holiday traditions, and the Sonoma-Cutrer family is no exception. Here in the heart of the Russian River Valley, the holidays are a time to gather and give thanks. The season officially kicks off with a long-standing Thanksgiving tradition as everyone gathers to eat delicious food and celebrate the year’s biggest accomplishments. This year, the Sonoma-Cutrer family toasted the launch of Founder’s Reserve Legacy, the second offering in the limited-release Winemaker’s Series. It’s a time for camaraderie and conversation, as colleagues sip Sonoma-Cutrer wine and share favorite recipes. In addition to the chef-prepared turkey and dressing, employees bring a family favorite side dish to share — and leaving a bit overstuffed is to be expected. Come December, it’s time to trim the holiday tree. During the annual event, employees gather to share holiday cheer and help put the finishing touches on the tree — often with handcrafted ornaments that feature a Sonoma-Cutrer theme. It’s also the season for another tradition at the winery: the annual holiday open house. The fireplace glows as traditionally dressed carolers fill the air with holiday songs and guests enjoy sips of soup, savory bites and sweets paired with Sonoma-Cutrer wines. While this year’s open house was on hiatus due to renovations at the winery, new traditions will join longstanding ones next December as the brand new tasting room will be open for special holiday tastings. The season of giving thanks is also a time to give back at Sonoma-Cutrer. Community outreach efforts include food and clothing drives for local shelters, and many employees volunteer to serve holiday dinners at shelters throughout the season. Sonoma-Cutrer sponsors a tree in Windsor’s Charlie Brown Christmas Tree Grove to benefit the Windsor Educational Foundation. With the holiday season well underway, the Sonoma-Cutrer family has had a chance to reflect on the many blessings of the previous year. The approaching New Year offers a chance to toast the good times, reflect on the challenges and look forward to another amazing year with a winery family that shares a passion and dedication to crafting the finest wine. Pinot Noir is a difficult grape to get right. Thin-skinned and temperamental, it’s among the most delicate varieties, and the conditions must be near perfect to produce exceptional fruit. So why would a winery known for its award-winning Chardonnay even bother with such an intractable addition? It’s a fair question, and one that’s been asked on more than a few occasions. The original inspiration had a lot to do with the vision of former Director of Winemaking, Terry Adams. It took some convincing to get the team on board. Rumor has it, a covert late-night planting session was required to produce evidence that Pinot Noir is, in fact, an ideal fit for Sonoma-Cutrer’s terroir. Producing Pinot is a natural evolution for a winery grounded in Burgundian winemaking traditions. The two major grape varietals grown in Burgundy, France happen to be Chardonnay and – you guessed it – Pinot Noir. It doesn’t hurt that the Russian River Valley boasts near ideal conditions for growing Pinot Noir grapes. Recently, Wine Enthusiast© magazine even named the winery’s home turf one of the top six areas for growing exceptional Pinot Noir. The goal of Sonoma-Cutrer has always been to craft wines that reflect their unique terroir, and Pinot Noir is no exception. 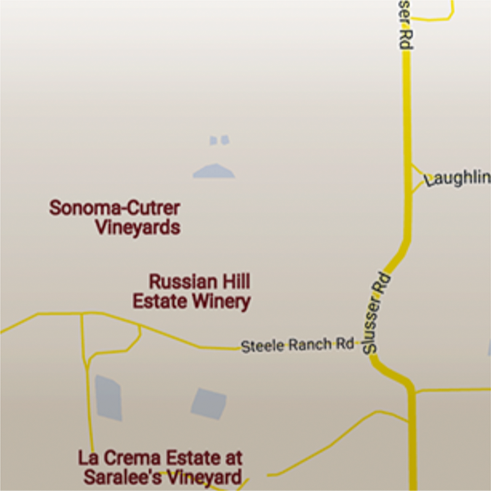 The grapes come from The Cutrer, Vine Hill, Owsley and Les Pierres vineyards. The unique terroir of each vineyard, from Owsley’s dramatic temperature fluctuations to Vine Hill’s 400-foot elevation change, is directly responsible for producing fruit with concentrated, complex flavors. It’s been more than a decade since the winery’s first foray into Pinot Noir production, and today four distinctive varieties are among Sonoma-Cutrer’s offerings. Among a well-decorated group, the popular Russian River Valley Pinot Noir has been awarded a gold medal from some of the most prestigious wine competitions every year since 2009. Twelve years into the “experiment,” Pinot Noir is no longer the new kid on the block, and has proven to be a worthy companion to Sonoma-Cutrer’s fine Chardonnays. This year’s annual harvest kicked off the last week of August, and the buzz of anticipation will linger until the last grape has been removed from its vine, around six to eight weeks later. During the harvest, nothing is more important than picking the grapes at their peak, but getting the timing exactly right involves a lot more than looking at a calendar. “Calling the pick” is a painstaking process that involves a little bit of chemistry and a whole lot of skill. It all starts with veraison, the ripening of the grapes that causes them to change color. The process began in July, and the fruit was closely monitored well into August, when Chardonnay grapes turned from green to a rich straw color, and Pinot Noir transformed from green to red and finally to a deep burgundy. When the colors are right, it’s time to start testing. Throughout harvest, a sampling crew goes out to collect a selection of 100 grapes from several different blocks among Sonoma-Cutrer’s six vineyards. Back in the lab, the grapes are tested for sweetness (Brix), acidity (Titratable Acid) and pH. The right balance signifies ripeness – but the numbers are only half the story. Once ripe, the fruit needs sufficient hang time to mature and develop the precise taste profile the winemakers are looking for. The ultimate goal is to harvest the grapes when they achieve the perfect balance of sweetness, flavor and texture. Daily “sugar meetings” are held every afternoon to determine which blocks should be picked the following day. The ongoing process moves from block to block throughout harvest until each vine hits its peak. Yet, there’s really no question who plays the ultimate role in determining the quality of the fruit: Mother Nature. And this year, Sonoma-Cutrer has been blessed once again. Expectations are high for this year’s harvest, as moderate weather has provided the fruit sufficient hang time to develop its full flavor potential. With harvest well under way, the yield looks good and the quality appears to be exceptional. Having a wine tasting in your home can be fun and enjoyable way to spend the evening. Here are a few tips and thought-starters to make the night a bit easier and more entertaining. Except for choosing delectable wines, good wine glasses are the most important part of your tasting. It is easy to go crazy with glasses made to go with specific grapes and, granted, I have many! But, filling your cabinet with a dozen different glasses for a dozen different wines and trying to figure out which wine goes with each isn’t exactly the same as hitting the easy button. So, I suggest having one or two quality wine glasses for starters. The size of the glass is probably the single most important factor. Glasses should hold at least 12 ounces. Personally, I prefer upwards to 20 ounces, especially for reds, which are typically served in larger glasses then whites. Pour the glasses about a fifth of the way to allow room for swirling and –to develop the aromas. A standard bottle of wine holds 25.4 ounces. With the intent on everyone trying each wine, one bottle of wine should serve eight guests or a 3-ounce taste. Divide the number of guests you have by eight and round up. This will tell you how many bottles you will need for the tasting. Remember to add more bottles if you are also serving a meal. Most Americans drink white wines too cold and red wines too warm. Overly chilled whites or too warm reds mask the aromas and flavors plus, alter the wines structure. Try serving whites around 50 degrees Fahrenheit and reds around 60 to 65 degrees Fahrenheit. This may seem too cool for red wines and not cool enough for whites but give it a go. You might be pleasantly surprised. Remember, wine is all about pleasure. So, if you end up preferring your wines cooler or warmer, enjoy them as such. Normally wines are served from lightest to fullest, whites before reds and, of course, dessert wines last. Our palates usually taste better when we progress in this order. To do it inversely would be like eating a steak and then a light seafood dish.. If you are tasting Sonoma-Cutrer wines, I suggest you try this order: Chardonnay- Russian River Ranches, Sonoma Coast, Les Pierres and The Cutrer; Pinot Noir- Russian River Valley; Sweet – Late Harvest Chardonnay. While tasting another delicious bottle of Chardonnay you noticed a flavor, a flavor you haven’t really picked up on before. You aren’t sure how to describe it. It is not quite popcorn, maybe it is cream…then all of a sudden someone says butter. The flavor is butter! This flavor is not present in all wines. Wines like Sauvignon Blanc, Riesling or Pinot Grigio, just wouldn’t taste right with it, but in Chardonnay it is a flavor nuance made in heaven. So where does this flavor come from? It is a natural or induced process called malolactic fermentation or secondary fermentation. This is sometime listed on the back of wine bottle labels but, rarely explained. In reality, it is quite simple. The process changes the harder Malic acid, which is an acid found in apples, especially green apples, into the softer rounder lactic acid, which is the acid found in milk. A by-product of this process is Diacetyl. Diacetyl has an intense buttery flavor. -This helps create a wine with a creamy, softer texture. The key to success in this process is that the buttery flavor does not dominate. Any wine that goes through malolactic fermentation will have a component of this tasty flavor, but the key is that it is in balance with the other flavors like the fruit and oak. Using malolactic fermentation is a brilliant way to enhance the complexity of balanced, flavorful Chardonnay. The next time you taste your favorite Chardonnay see if you detect the nuance of malolactic fermentation. This wine tasting primer is designed to give you a comprehensive understanding of the components of tasting wine. To make it easier, feel free to taste along if you wish. All you need is a quality wine glass of eight or more ounces and a bottle of Sonoma-Cutrer 2012 Sonoma Coast Chardonnay. Sight- Usually a full color will suggest a full wine and a light color will suggest a light wine. Our Sonoma Coast Chardonnay is yellow-gold, clear and bright. Smell- I use the acronym FEW to help remember this part of the tasting. F stands for fruit and floral, E for earth and W for wood or oak. Nothing warms the soul during cold weather quite like savory roasted meats, and nothing can elevate a dish from cozy comfort food to dinner party showstopper quite like the infusion of fresh, aromatic herbs. Here at Sonoma-Cutrer, the chef’s garden is chock full of fresh herbs like mint, rosemary, cilantro and parsley. The aromas of these herbs infusing their flavor into meat and veggies fill the air as the winery’s signature roast dishes take center stage for the season. Every kitchen needs a go-to roast chicken recipe, and this herb-infused version is a perennial favorite, thanks to the flavors of rosemary, thyme, parsley — and a whole lot of garlic. Pop open your favorite bottle of Sonoma-Cutrer Chardonnay to use in the dish, then enjoy a glass over dinner. Or try this roast chicken accompanied by a side of herbed french fries, a can’t-miss classic made with rosemary and parsley. A truly versatile herb, mint is commonly paired with lamb in the Mediterranean. Take advantage of all that beautiful mint flourishing in your winter garden in this irresistible lamb dish with mint salsa verde. Lock in the flavors by searing the meat on the stovetop, then finish it off with a brief roast in the oven. Create a perfect pairing with Russian River Valley Pinot Noir. Any of Sonoma-Cutrer’s Pinots also make the perfect sidekick to classics like beef tenderloin and pot roast with winter root vegetables. And when you prepare your favorite roast dish with the freshest herbs of the season, chances are there won’t be a bite left. Have a few herbs left over? Trim the stems and put them in a cup of water, then cover loosely with a plastic bag and refrigerate. Change the water and trim the stems daily for the best results. The exceptions are mint and basil, which are best kept at room temperature. Cooking with wine shouldn’t be intimidating. Follow a few essential tips to select a suitable wine for your recipe, and you’re well on your way to enhancing the flavors of your favorite dishes. First things first: Skip the bottle of “cooking wine” found on grocery store shelves. Often laden with salt and additives, this “wine” won’t add much to your work in the kitchen. The rule of thumb is to avoid cooking with a wine you wouldn’t enjoy drinking. When mild-flavored recipes call for wine, opt for a crisp white. Acidity and citrus can bring out the delicate flavors of seafood, while a creamy Chardonnay can complement richer recipes ranging from lobster dishes to chicken with cream sauce. You can’t go wrong reaching for a bottle of Russian River Ranches, Sonoma-Cutrer’s most versatile Chardonnay. Light, medium bodied and easy to pair with a wide range of foods, it’s well suited for everything from seafood salads to marinades for meats and vegetables. When a recipe calls for a red, be mindful of tannins. These bitter compounds are concentrated when cooked and can become harsh and astringent. Play it safe by opting for a smooth Pinot Noir, such as Sonoma-Cutrer’s Vine Hill. This medium-bodied red with rich fruit flavors accents ingredients rather than overpowering them. Any of Sonoma-Cutrer’s Pinots work well for a classic beef dish like boeuf bourguignon, but you don’t have to limit this refined red to meat dishes. Need an inspired hors d’oeuvre for your next cocktail party? Try serving dried cherries in a Pinot Noir reduction prepared with Russian River Valley Pinot Noir. Which brings us to the best part about cooking with wine — the glass you get to sip while whipping up your masterpiece. Sonoma-Cutrer is known for its dedication to craftsmanship, and nowhere is this more apparent than in the winery’s Grand Cru Barrel Program. The meticulous process of creating a single hand-crafted barrel takes nearly three years. Why spend so much time and effort on a humble aging container? Simple: Each oak barrel plays a significant role in the flavors that end up in your favorite glass of Sonoma-Cutrer Chardonnay. It all starts with the finest French oak, hand selected from individual forests in the heart of France. Professional merrandiers, along with our winemakers, choose specific trees that meet Sonoma-Cutrer’s exacting standards, including straight, tight oak grain with minimal knots, which can cause barrels to leak. The location of the trees is equally important, as each variation infuses the finished product with distinct flavor notes. For example, the tight grain oak found in slow-growth trees common to cooler climates contributes structure to the wine that allows the fruit to express itself — perfect for the crisp, mineral Les Pierres Chardonnay. Slightly wider grain oak adds caramel and spice characteristics, which complement wines like The Cutrer. Once selected, the oak is split by hand and seasoned outdoors for 24 to 36 months. Exposure to the elements helps reduce sap, tar and resin in the wood. More importantly, it rids the oak of harsh, bitter tannins. During the seasoning, the splits are turned every 6 months to ensure all unwanted characteristics are leeched from the wood. Two small family-run tonnellerie’s (coopers) in the Burgundy region then craft the seasoned wood staves into barrels. A relationship that goes back decades, these Old World master craftsmen create barrels specifically suited to the styles of wine produced by Sonoma-Cutrer. Finally, the barrels are “toasted” over a low, wood-burning fire for up to an hour, depending upon the desired result. Toasting transforms the barrels from a raw, sawdust-type of wood to oak that’s infused with vanilla, caramel, spice and other wine-enhancing compounds. When it comes to blends like Russian River Ranches and Sonoma Coast Chardonnay, the winemakers play the role of chef. Just like their culinary counterparts, who add a variety of spices to any given dish, the winemakers mix oak from various forests and toast levels to add complexity. At Sonoma-Cutrer, where attention to detail extends to every corner of wine production, aging Chardonnay is its own art form. Entertaining in style takes a lot of effort. Chances are, you spent some time selecting the perfect heritage meats, organic veggies and Sonoma-Cutrer wines for your impressive dinner spread. Why waste an ounce of your invested efforts? Nose-to-tail eating, a term used to describe the practice of cooking with all parts of the animal, has been getting a lot of attention lately at trendy restaurants. This holiday season, why not bring this eco-conscious practice into your home by getting creative with your leftovers? Often overlooked items like picked-over bones, vegetable trimmings and even those last few sips of wine can be used to turn up the flavor on future meals. Meat bones are worth their weight in gold when used to make stock. Did you treat your guests to a prime rib roast, smoked turkey or traditional holiday ham? Don’t even think about tossing those bones. Homemade stock can add depth and incomparable flavor to everything from soups and stews to grain dishes and sauces. Stocks are also an ideal place to use up stray carrots, extra stalks of celery, onions and fresh herbs like thyme and parsley. Once you’ve tasted the difference homemade stock makes, you’ll never go back to the store-bought variety. Can’t stomach another second in the kitchen? Understood. Simply freeze the bones until you’re a little more inspired. The same goes for veggie trimmings, including carrot tops and onion skins, which you can throw into your meat stock — or save for a flavorful veggie version. Skip cruciferous veggies in your stock (they’ll make it taste sour), but don’t toss any leftover Brussels sprouts, cauliflower or even broccoli stems. Instead, roast them up with any remaining herbs and serve over rice, or throw them in a tasty frittata. As for all those quarter bottles of wine leftover from your festive dinner? Cook with it. Pour any lingering wine into ice cube trays, freeze and you’ll be prepared the next time you need to deglaze a pan or whip up a sauce. With a little foresight, you can make the flavors from your high quality ingredients last all season long. The holidays are packed with festive events, from cocktail parties and celebratory dinners to New Year’s bashes. And while your calendar may be packed with a variety of occasions, there’s one cardinal rule that applies to any holiday event: Never show up empty-handed. You can’t go wrong presenting the host with a nice bottle of wine, but deciding which one to bring can be daunting. Have a little fun this holiday season by matching the wine you give with the “personality” of the gathering you’re attending. Use this cheat sheet to find a bottle of Sonoma-Cutrer wine to complement any type of occasion. Then, apply the same personality-matching principal to all of the individuals on your gift list. Heading to a festive dinner party? Go with a versatile white like Sonoma-Cutrer’s Russian River Ranches Chardonnay. While you shouldn’t count on the host opening your bottle on the spot, it’s a nice gesture to bring a wine that’s ideal for entertaining and pairs well with a wide range of foods. This versatility also makes Russian River Ranches perfect in a pinch. Did a neighbor or coworker give you an unexpected gift? While you may not know their specific wine tastes, this medium-bodied white is a popular favorite among a wide range of pallets. If a gift exchange or other intimate gathering is part of your evening plans, bring along a wine that can add depth to a warm holiday gathering, such as an elegant bottle of Russian River Valley Pinot Noir. Packed with juicy dark fruit, this silky red is best savored over good conversation in front of a crackling fireplace. When it’s time to ring in the New Year, opt for a white wine that’s worthy of toasting an entire year, such as Sonoma-Cutrer’s Founders Reserve Legacy Chardonnay. Perfectly suited for a special occasion, this limited-release wine also makes an ideal gift when only the best will do. Sure to impress anyone from your boss to your significant other, this rich, creamy and complex Chardonnay will leave a lasting impression. With these three iconic bottles of Sonoma-Cutrer wine on hand, you’ll be prepared for the festive holiday season.